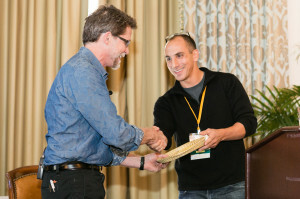 Chefs Collaborative recognizes individuals who have played an exemplary role in transforming our food system Awards are presented at the Chefs Collaborative Sustainable Food Summit annually. Read more about the award types. 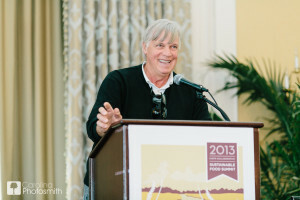 From November 3-5, hundreds of chefs and food activists from around the country gathered in Charleston for the Chefs Collaborative Sustainable Food Summit to connect and share strategies, ideas and practices for transforming our broken food system. Chef Michel Nischan of Wholesome Wave foundation and Dressing Room restaurant in Westport, CT, announced the 2013 Sustainability Awards honorees at a lunchtime ceremony at Lowndes Grove. Chef Rick Bayless, a founding board member of Chefs Collaborative, is the 2013 National Sustainer. “All that Rick does, from continuing to reinvent his business to the Frontera Farmer Foundation, makes me feel like I’m not doing enough,” said Chef Michael Leviton, of Lumiere and Area Four restaurants in the Boston Area and chair of the Chefs Collaborative Board. Chef Anne Quatrano, owner of Bacchanalia, Floataway Café, Star Provisions, Provisions to go, Quinones at Bacchanalia, Abattoir in Atlanta, is the 2013 Southeast Sustainer for mentoring countless young cooks and communicating a strong sustainability ethic. 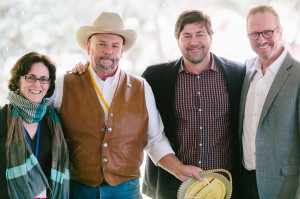 Will Harris, president of White Oak Pastures, in Bluffton, GA, is the 2013 Foodshed Champion, for setting the gold standard for humane animal production. Glenn Roberts, founder and partner of Anson Mills, Columbia, SC, is recipient of the Pathfinder Award for being a singular leader in the movement to restore heritage grains to their rightful place as a centerpiece of our food supply. Paul Willis is a second generation farmer who has advocated for sustainable and humane animal welfare through hog farming. He believes in raising hogs outdoors or in deeply bedded pens, not only because it allows the pigs to demonstrate their natural behaviors but also because it creates a higher quality product. Over the past 30 years we have lost over 96 percent of hog farmers in the U.S. while the average number of hogs per farm has risen by over 1000%. As the industry transitioned to an industrial method of farming Paul worked to preserve traditional hog farming methods- both for the farmer and the consumer. “I feel it is the duty for all of us who love working with the land to share the information we have gained with others. This farm school is my goal for passing on the knowledge gathered over the last 20 years on this piece of land,” says Lora Lea Misterly, co-owner of Quillisascut Farm in Rice, WA. 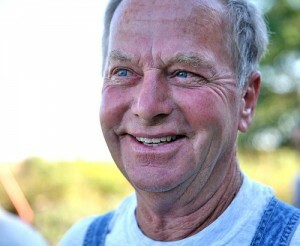 For thirty-one years, Rick and Lora Lea Misterly have been living the “slow life,” growing Quillisascut Farm. They started out with a bare piece of ground; gradually over time they have built a home, a farmstead, a cheese business and a culinary school to share their love for all things farm to table – building healthy soil, maintaining a vibrant garden, nurturing seeds that tell a story of love, beauty, taste and seasonality. Kären has mentored, inspired and taught chefs and culinary students through her work as a chef/instructor at Seattle Culinary Academy, and chef/instructor at Quillisascut Cheese Company’s Farm School, teaching professional chefs, culinary students and agricultural professionals farm to table practices and philosophies. She is the founder of the Seattle Chefs Collaborative chapter and is still active on the board. She is the co-author of “Rethinking the Kitchen,” the sustainable kitchen handbook. Chefs Collaborative added three 2012 honorees to its “Pioneers Table,” which was established in 2010 to recognize individuals who have made longstanding and exemplary efforts in transforming the sustainable food landscape. The Pioneers Table honorees, selected by the Chefs Collaborative Board, are true sustainable food pioneers who broke with tradition early on to pave the way for legions of chefs and culinary professionals. 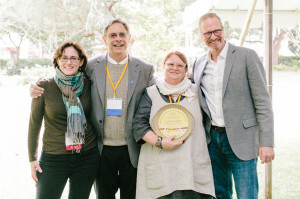 Hayward was honored with the “Sustainer of The Year” award, which recognizes a chef who has been both a great mentor and a model to the culinary community through his purchases of seasonal, sustainable ingredients and the transformation of these ingredients into delicious food. “Sam has very quietly been doing this for a long time and has trained generations of chefs,” said chef Michael Leviton of Lumiere and Area Four restaurants in Newton and Cambridge and chair of the Chefs Collaborative Board. “Not only that, but he has been a champion of a cuisine that is uniquely representative of Maine’s bounty,” added Leviton. 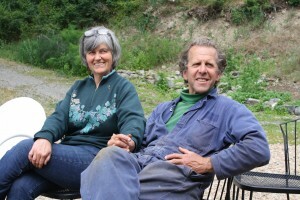 Sal and Al Sunseri received the “Foodshed Champion Award,” which recognizes a food producer (farmer, fisher or artisanal producer) committed to working with chefs who also exemplifies the following principle: Good food begins with unpolluted air, land, and water, environmentally sustainable farming and fishing, and humane animal husbandry. “No institution has played a larger role in the advancement of south Louisiana’s oyster industry than New Orleans’ P&J Oyster Company, the oldest business of its kind in the United States,” said Kogut. “Since the oil spill, many are worried about the long-term sustainability of this important Louisiana business. P & J Oysters is working with amazing energy to ensure Louisiana oysters have a future,” said Kogut. Chefs Collaborative added nine 2011 honorees to its “Pioneers Table,” which was established in 2010 to recognize individuals who have made longstanding and exemplary efforts in transforming the sustainable food landscape. The Pioneers Table honorees, selected by the Chefs Collaborative Board, are true sustainable food pioneers who broke with tradition early on to pave the way for legions of chefs and culinary professionals. Sustainer: Chef Peter Davis – Henrietta’s Table, Cambridge, Massachusetts, was honored with the Sustainer Award, which recognizes a chef who has been both a great mentor and is a model to the culinary community through his/her purchases of seasonal, sustainable ingredients and the transformation of these ingredients into delicious food. Pathfinder: Chef Chris Koetke – Culinary Arts Programs at Laureate International and Kendall College in Chicago, Illinois was honored with the Pathfinder Award, which recognizes a visionary working in the greater food community who has been a catalyst for positive change within the food system through efforts that go beyond the kitchen. Foodshed Champion: Allison Hooper and Bob Reese – Vermont Butter & Cheese Creamery, Webstervile, Vermont were honored with the Foodshed Champion Award, which recognizes a food producer (farmer, fisher, artisanal producer) committed to working with chefs and who exemplifies this principle: Good food begins with unpolluted air, land, and water, environmentally sustainable farming and fishing, and humane animal husbandry and who has formed successful, lasting partnerships with chefs. Chefs Collaborative added ten 2010 honorees to its “Pioneers Table,” which was established to recognize individuals who have made longstanding and exemplary efforts in transforming the sustainable food landscape. The Pioneers Table honorees, selected by the Chefs Collaborative Board, are true sustainable food pioneers who broke with tradition early on to pave the way for legions of chefs and culinary professionals. Carrie Balkcom, Executive Director of the American Grassfed Association and past longtime board member of Chefs Collaborative. Chef Rick Bayless of Frontera, Topolobampo, and XOCO restaurants in Chicago and former president of the Chefs Collaborative Board. Chef Jesse Cool of Flea Street Café and Cool Café as well as a former member of the Chefs Collaborative board. Chef Ann Cooper, known as our nation’s renegade lunch lady, was the first vice-chair of the Chefs Collaborative board. Dun Gifford, President of Oldways, until his untimely death in May, 2010. Chef Peter Hoffman of Back Forty in NY and past longtime board member and former president of the Chefs Collaborative Board. Chef Michel Nischan of the Dressing Room in CT is founder of Wholesome Wave Foundation, and former board member of Chefs Collaborative. Chef Odessa Piper, a past successful restaurant owner, a champion of regional foods, and former board member. Chef Susan Spicer of Bayona and Mondo in New Orleans, was a founding board member of Chefs Collaborative.